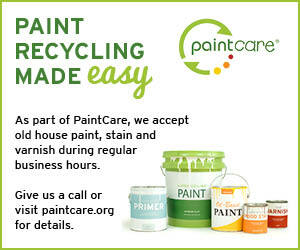 Let the world know that you are proud to be part of PaintCare, promote your drop-off site location! Use our toolkit of customizable digital, social media, and print ad templates below for your promotion efforts. If you need help customizing them, PaintCare staff can assist you. Place the digital banners below on your website or social media pages to remind customers that you take back leftover house paint for free. 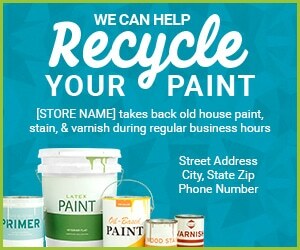 Link the ad images to www.paintcare.org so visitors can learn more about recycling paint and accepted products. Download the artwork and it’s ready to use (right click on the image and save to your computer). These files are 300 pixels wide by 250 pixels high. The last banner on the right can be customized to show your address and phone number. For assistance customizing banners (tall, wide, square, different wording, your location), just let us know by emailing info@paintcare.org. 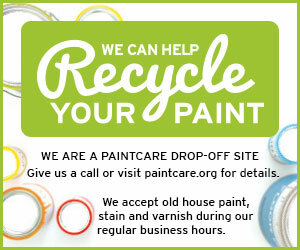 Promote your location as a PaintCare drop-off site in a newspaper or newsletter. For assistance with customizing the size and content of the ad shown here, e-mail us at info@paint.org. Please provide the desired size of the ad, as well as the name, address, and phone number for your organization as you would like it to appear. Don’t forget to include your name and phone number, so that we can contact you with any questions.